There seems to be a great divide between people who love candy corn and people who hate it with a passion. In our little corner of the internet there is nothing but love for the tiny, waxy, yet strangely addicting treats. Halloween has always been our favorite holiday, seriously who didn't love getting getting dressed up and collecting a massive bag full of free candy? Yet of all of the varieties of candy given out nothing is as quintessential to Halloween as candy corn. 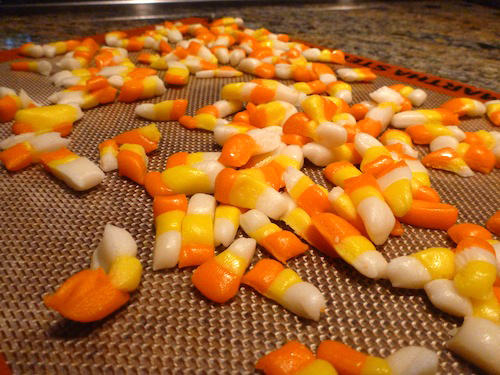 Candy corn has been a staple of the season since the 1800's, when it was first release by the Wunderlee compoany. As we have said however, not everyone is a fan of these brightly colored candies. Comedian Lewis Black once said "Candy corn is the only candy in the history of America that’s never been advertised. And there’s a reason. All of the candy corn that was ever made was made in 1911. And so, since nobody eats that stuff, every year there’s a ton of it left over. And the candy corn company sends the guys to the villages and they collect out of the dumpsters all the candy corn we’ve thrown away. They wash it! They wash it!". We beg to differ on the subject, which is why we were so pumped when we received the October issue of Food Network Magazine. As would be expected the October issue from Food Network was filled with Fall/Halloween themed recipes. While we were flipping through the pages we saw it, there was a recipe for homemade candy corn provided by none other than Alton Brown. Alton is known for his ability to make the science of cooking accessible to chefs of all skill levels. He is also a man has no issues proclaiming his love for one of our favorite Halloween treats. 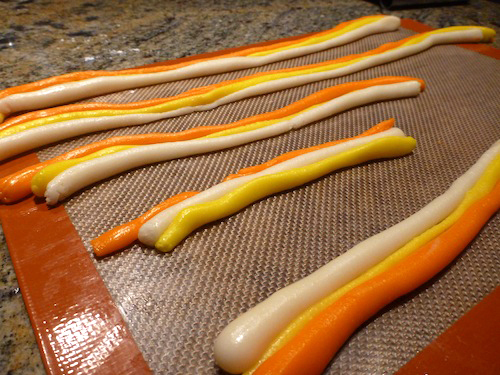 Like us, Alton enjoys candy corn each Halloween and has gone even further as to provide a recipe for making it at home. The recipe looked quite simple and with most of the ingredients in our kitchen, we decided to go for it. Combine the sugar, corn syrup and water in a 2-quart pot. Put over medium heat, cover and cook for 4 minutes. Add the butter, clip on a candy thermometer, and bring the mixture to 230 degrees F, about 1 to 2 minutes. When the sugar syrup reaches 230 degrees F, take the pot off the heat and remove the thermometer. Add the vanilla and the dry mixture, stirring continuously with a silicone spatula until well combined. Pour onto a half sheet pan lined with a silicone baking mat. Cool until the mixture is cool enough to handle, about 10 to 15 minutes. Divide the dough into 3 equal pieces. Add 2 drops of yellow food coloring to 1 piece and knead the dough until the color is consistent throughout. Add 2 drops of orange to the second piece, and knead until the color is consistent throughout. Leave the third piece white. 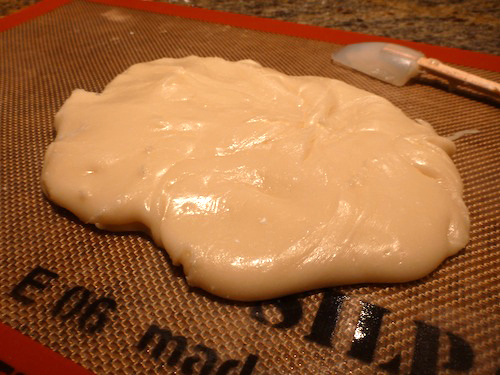 Roll each piece of dough into a strand, about 18-inches long. Cut each strand in half. Roll 1 of the white pieces into a strand that is about 1/2-inch thick and about 22-inches long. Repeat with a yellow piece and orange piece. Lay the strands side by side and press them together using your fingers. Cut the strand into 4-inch pieces. Lay the strands, 1 at a time, onto the silicone mat and press into a wedge shape, like a triangle. Use a wire butter slicer to cut the candies into pieces. If you don't have a wire butter slicer, use a knife, metal bench scraper or pizza cutter to slice the dough into small pieces. Repeat the procedure with remaining dough. Lay the finished pieces on a piece of parchment or waxed paper to dry for 1 hour. Store in an airtight container with parchment paper between each layer. 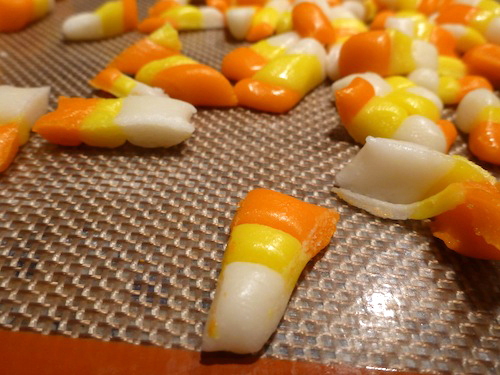 This recipe will convert any candy corn hater. Alton Brown provides a great take on the Halloween classic. These homemade treats have a similar flavor profile to store bought brands, but differ in taste and texture. Making these from scratch creates a less "processed" flavor. The vanilla flavoring and sugar really stand out in each bite and are sure to please even Lewis Black. The consistency of the candy corn is a bit softer and chewier than the waxy hard candy corn of your childhood. While we prefer candy corn to be a bit harder, they are still quite good. The process of making each corn was a bit time consuming especially shaping and cutting each piece. However it was certainly worth the effort and would be a fun recipe to get the entire family involved in making. Any candy corn fan will surely love this recipe and candy corn haters should give this recipe a try before they condemn this corn. These are not the same pieces of candy corn that have been washed and re washed over the years. They are a fresh batch of tasty treats that are sure to please and are a Should Eat for us!